The background was created off-camera by gluing down some tissue paper, printed with script, onto Strathmore Mixed Media paper. The background was a little too strong for the Distress Paints, so I knocked it back with a light coat of gesso. I then used Distress Paint in Shabby Shutters and Peeled Paint and applied them with a brayer to finish creating the background. 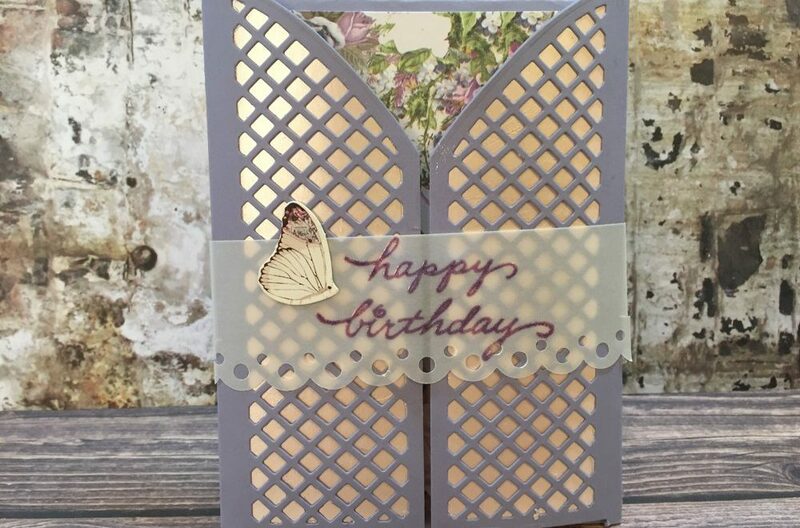 The stencils that I used were cut on Silhouette Stencil media using designs from the Silhouette Design Store. This was my first time creating a custom stencil with this material. I’m split on whether the sticky backing on the stencil material is a good thing or not. It was excessively sticky and initially tore the surface of the page. However, when using wet art supplies, the sticky back did a good job of preventing colors from seeping under the stencil. To combat the stickiness, I dabbed a tissue across the surface of the stencil back so it wouldn’t stick quite as bad. That did the trick. 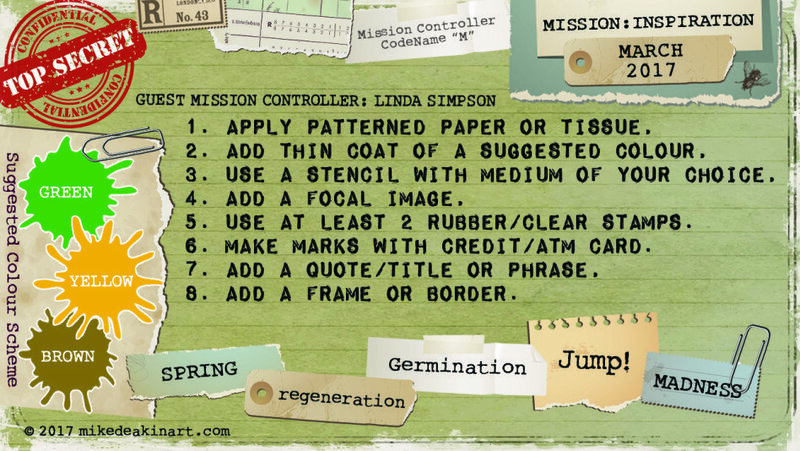 Next, for the background, I tore a piece of scrap paper into the shape of a hill and used Archival ink in Fern Green. 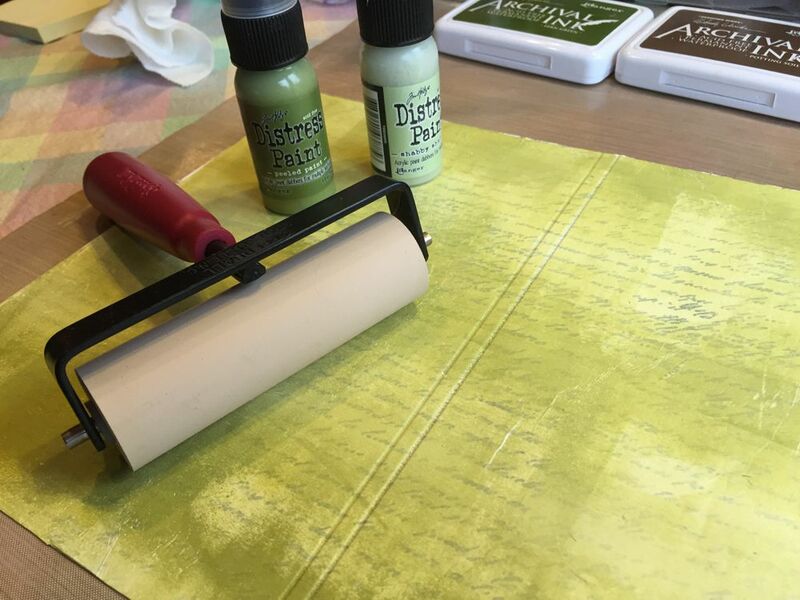 I also stamped the grassy background by applying the Fern Green ink on a Docrafts stamp . After the background and ink were thoroughly dry, I stamped the fairy using purple Versafine ink. 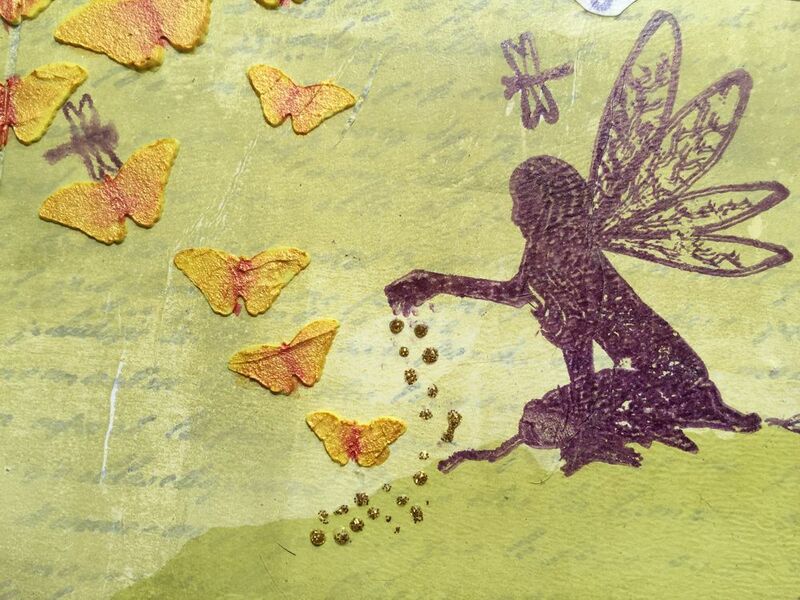 I love this fairy from Lavinia Stamps; I had originally purchased her to use on a page depicting my mom, who loves to garden, with my nieces. 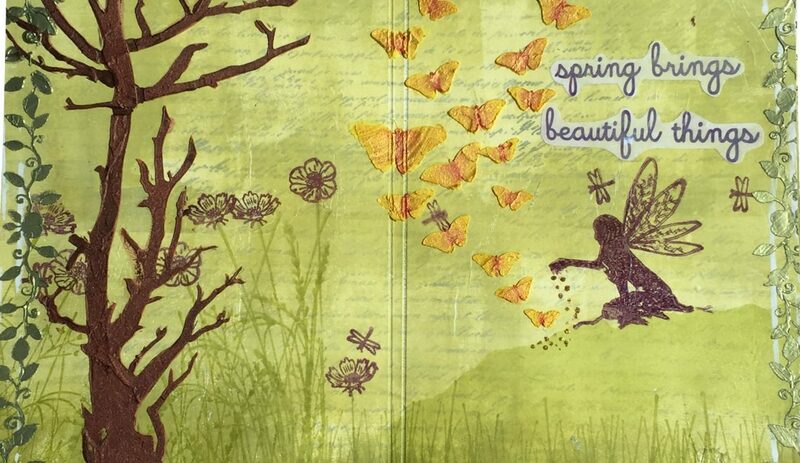 Here, instead of flowers, she is sowing butterflies. 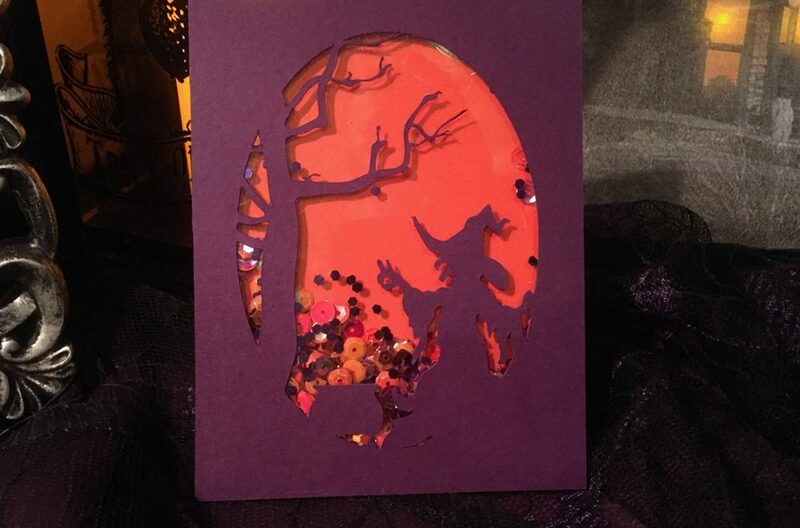 The tree was created with a TCW stencil that I had originally purchased for a Halloween page because it looked spooky. I mixed a tiny dab of Lindy’s Magicals into a drop of water to thoroughly hydrate the magical powders. 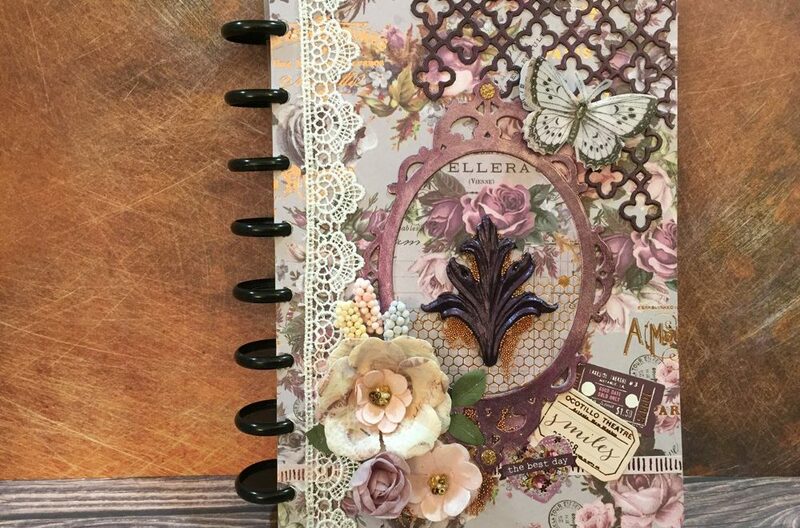 This allows all of the various shades of color that make up the magicals to be completely dissolved before incorporating it into the texture paste. 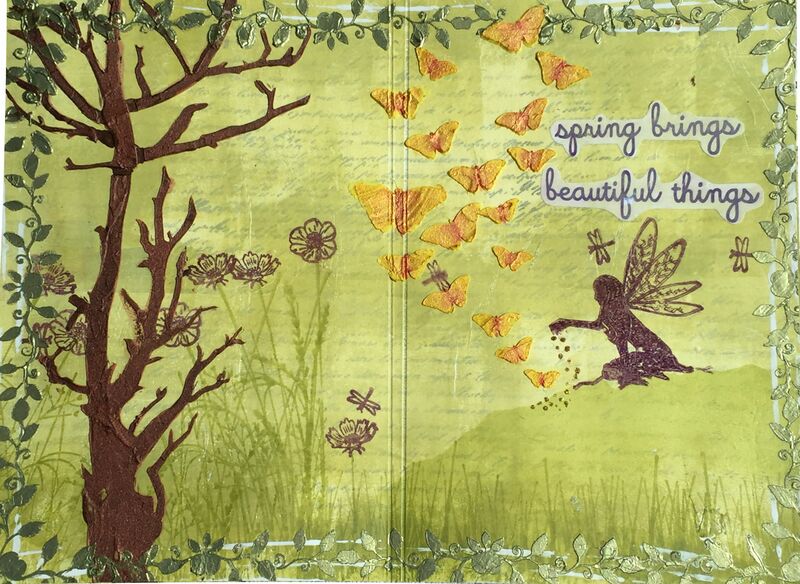 I did this for the yellow of the butterflies and for the chestnut brown tree. 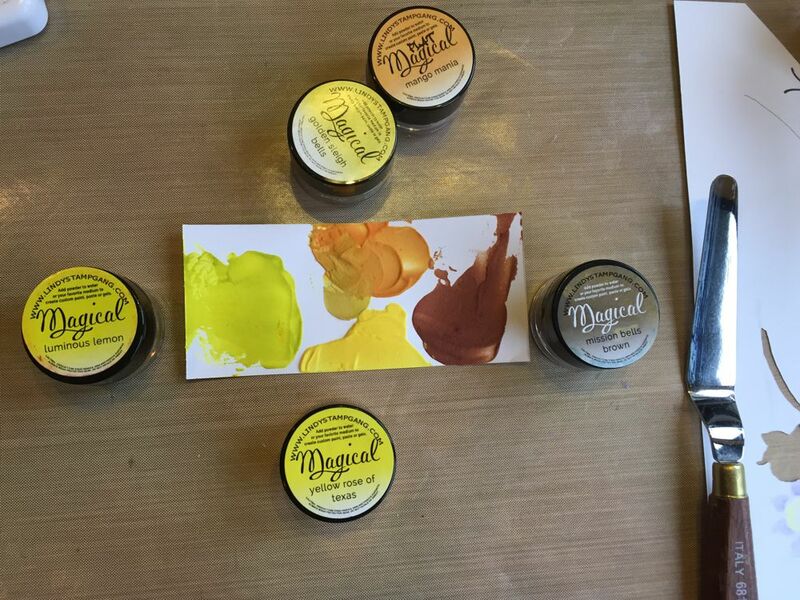 Using the Magicals to tint the paste allows there to be color all the way through. 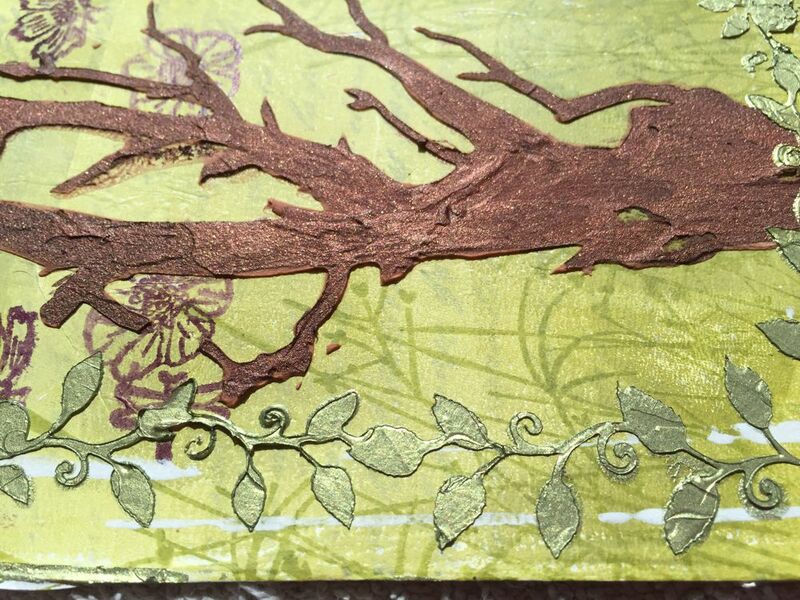 After the texture paste dried completely, I enhanced the color of the tree and the butterflies with Colourarte Silks paints. The Silks also filled in the gaps left by the stencil. Finally, the texture paste used on the leaves for the border is the exquisite Cosmic Shimmer Texture Paste in Chic Moss. This is the first time I’ve used it in a project and love how it reflects the light. I love the building of layers with progressively darker colors. 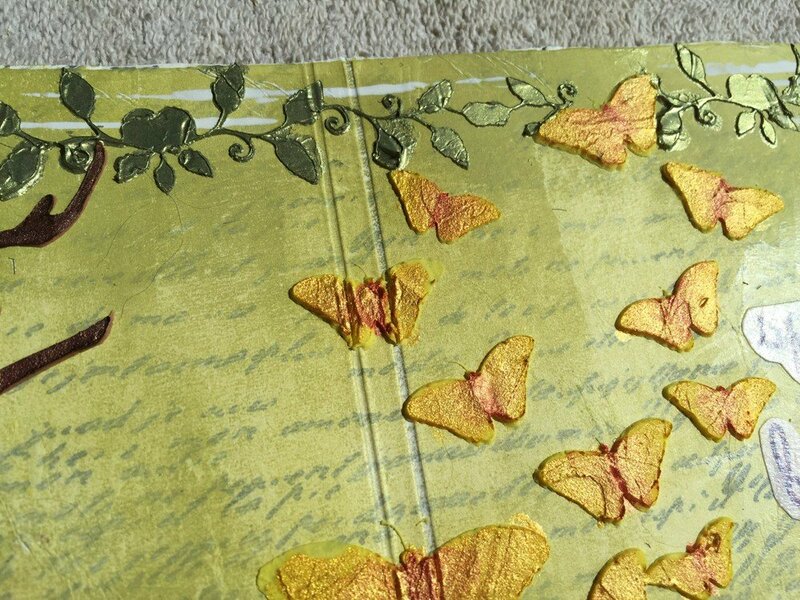 And I loved the thick uneven texture on the butterflies which makes the Silks paint reflect lots of light.